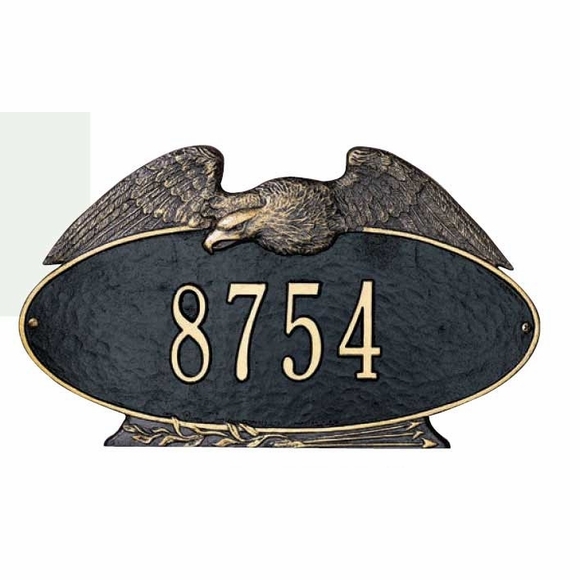 Eagle Oval Address Sign - - Eagle Oval Address Sign - - wall mount or lawn mount custom made oval address plaque placed within the wings of a golden eagle. Holds one or two lines of personalization. Two sizes: 16" x 9.25" and 24" x 14". Made in USA. The 16" x 9.25" sign holds one line only - - up to five (5) 3" characters. If you are ordering a one-line sign, please leave the Line 2 input box emtpy. The two-line 24" x 14" sign holds up to five (5) 4.5" characters on Line 1 and up to seventeen (17) 1.75" on Line 2. Shown above in black with gold characters. Eagle color is standard. Dimensions: 16" x 9.25" and 24" x 14". 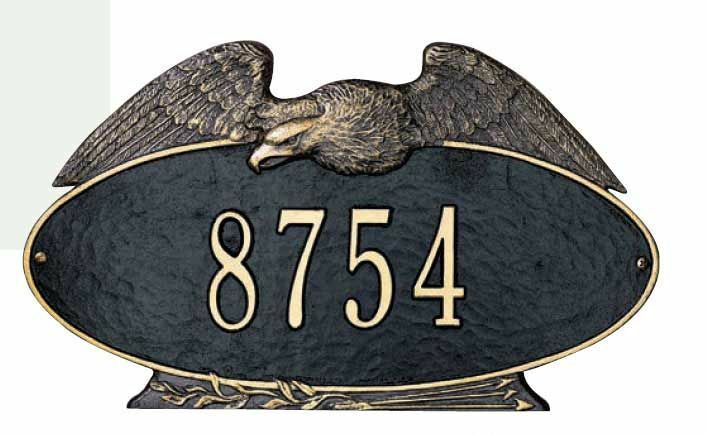 Eagle Oval Address Sign wall mount or lawn mount custom made oval address plaque placed within the wings of a golden eagle. Holds one or two lines of personalization. Two sizes: 16" x 9.25" and 24" x 14". Made in USA.